I have progressively looked at how we use power on the ground floor. This circuit, along with all others in the house, is sub-metered. A review of the data from all sub-circuit meters showed that the ground floor and lower ground floor, combined, were responsible for some 50% of total electrical energy use (see previous post). The chart below shows the proportional distribution of power on the ground floor as it currently stands. 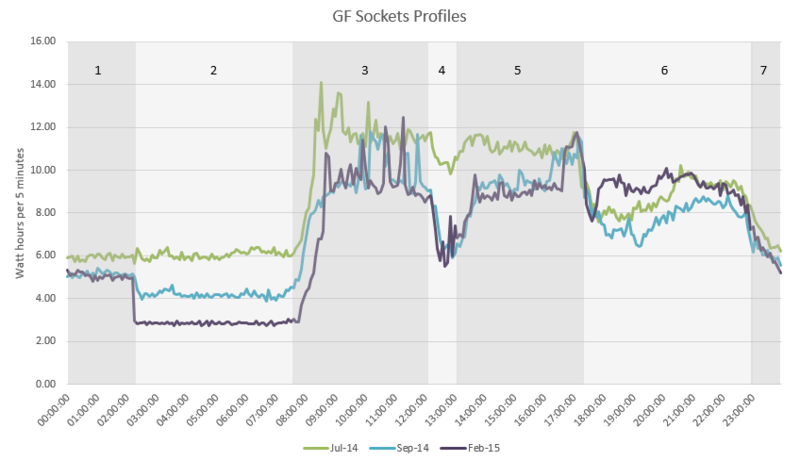 This data is taken from additional plug-in meters on some key-use sockets, which have been installed since November 2014. As we run two small businesses from home, much of the power is related to IT on this floor. The ‘study’ and ‘studio’ represent the two business areas, which together are responsible for around 40% of the use on this circuit. IT servers and comms equipment are powered from a central point, and this adds a further 23%. Broadly speaking, we could say that 2/3rds of the power use on the ground floor is related to IT equipment – 85% use of which is business-related; 15% for recreational (browsing, etc). What still jumps out at me is the amount (currently 23%) for TV equipment, namely a small 22in Philips TV and a Virgin V+ box. This is the only TV equipment in the house: we don’t watch that much. So why are these two bits of equipment responsible for so much use. 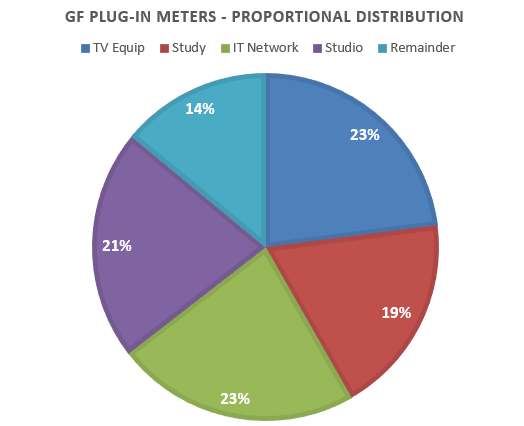 The plug-in meters have only been in since November 2014, and we had made some interventions before this point, so the proportion (pre-November) would have been significantly higher than 23%. The chart below shows the daily average profiles for three key months over the last year and illustrate the interventions made. Bands 1 to 7: 1, 2 and 7 are overnight, 3 and 5 are working hours, 4 is lunch break, and 6 is evening. The green line represents July 2014. This is the baseline: using IT and TV equipment without any specific intervention to reduce energy. In August I plugged in a time switch to switch the Virgin V+ box off between 0200hrs and 1600hrs (we never watch or have anything set to record during these times). The benefit of doing so is shown in the September 2014 profile (blue) in band 2. Also in August, several local drives were replaced with two main server drives – the difference in power use in bands 3 and 5 shows that the new equipment is less power hungry (≅80 kWh/yr saving). In January 2015, the Philips TV was added to the timer circuit, and the timer adjusted slightly (0200 to 1700 hrs). This is shown by the purple line for February 2015. Now the TV and Virgin V+ box both switch off for 15 hours in every 24, and this translates to 140 kWh/yr for the V+ box and a further 100 kWh for the TV: a total of 240 kWh/yr, around £35. The £5 timer has paid for itself in less than two months! Why does the TV equipment use so much in standby? Hopefully, the new EU Ecodesign Directive will have sorted this out for future replacement equipment. The chart shows our current baseload (band 2) as 34 Wh (2.8 Wh/5mins), or 0.8 kWh/day (300 kWh/yr). This is due to the broadband router (which can’t be time clock controlled) and server equipment in standby/eco mode. At £45/year, we may need to accept that this is as good as it gets. May be Virgin will bring out more energy efficient equipment in the future (V+ box and broadband superhub): if not we may need to consider alternatives. Overall, whether due to specific interventions, or down to incidental benefit of replacing equipment, the energy savings from this one circuit is forecast to be around 320 kWh/year, approximately £48 – a 10% reduction on our total electricity use. This entry was posted in Monitoring, Performance and tagged Electrical Energy, Energy use by admin. Bookmark the permalink.